Initial sales and quoting was very responsive which gave me positive feeling to go with Will. However, the delivery time was a bit longer than expected and I had to follow up for updates. Finally installation was completed Aug 2018 but overall was a 7 out of 10 due to imperfections to the product, poor caulking / glue and weather stripping. 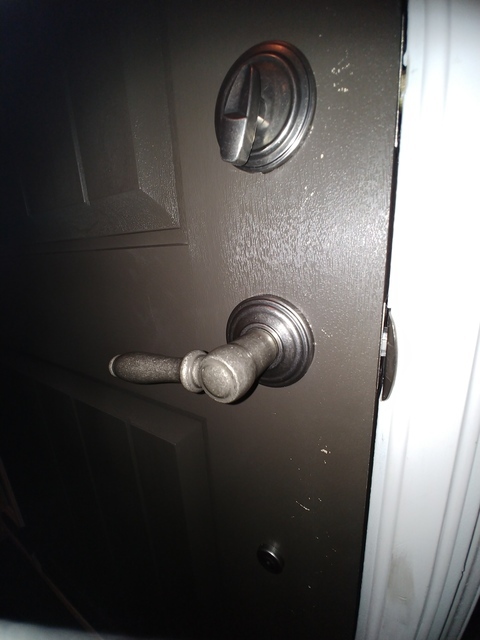 Now after 4 months the paint job is already worn down, the lock gets caught and all the flaws are still not addressed after 3 follow up calls. Just to clarify, your order was placed during the Busiest time of the year which is why we discussed this with you to ensure you were aware of possible delays. The heavy rain we were having around that time also contributed to our back up on all orders. In regards to the installation, we always do our best with what we have to work with (caulking). We do not use glue, and we also strongly recommended for you to get a Multi Point lock for your new Fiber Glass door. Unfortunately, you decided to use the pre-existing lock that was on your old door. This also must be what is causing an issue with your weather strips. In terms of the paint chips seen in the photo you attached, it seems as if it was caused by someone or something. We would have never left one of our products looking like that. I have answered and responded to you every time you've reached out, even when I was on vacation. If you'd like to further discuss this, feel free to contact me directly by phone or email. Have a great day.